Developer Quote: "Calls, Messages, Mails, Map, Localization, Music... All in one essential app!" You may spend a lot of time hopping between one app and another, trying to take care of business, getting hold of family, or merely socializing. Your email and messaging apps are always open in your tray. 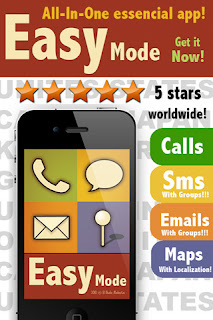 Easy Mode makes it easy for you to do and fun and serious stuff all within one app! Make calls, text messages or write emails, listen to your music, or find locations on a map with this one neat app. - Need to make a call? Just tap on your contact which is set in a row with big, easy-to-read letters and photo. You won't make a mistake tapping the wrong contact here (something I've done many times before)! - Send text messages or emails to one or more contacts or groups. Use a keypad to easily make calls. Make your own texts templates, and send them with just two taps, without mistakes. - Change the map to Standard or Satellite depending on which view suits you best! Locate yourself, friends or a place you need to visit. - Control the music you're enjoying, or create a playlist, all within the app. Play, pause, turn the volume up or down, all while you send a text, email, make a call, or use the map. - Enjoy a clean, sleek and attractive app which is easy to use in both portrait or landscape mode, while boasting retina display. Easy Mode is not just a cool messaging app, it is the springboard upon which many of your daily activities are based. COOL CONCLUSION: "Easy Mode lets you keep in touch more efficiently with those you care about by covering all your bases in one sharp communications app."